About the Arts and Heritage Group: Our newly remodeled Town Hall offers space for people to gather to share experiences and memories. It also offers space where historic artifacts, photographs, maps, paintings, quilts, fiber art and other items that reflect our heritage may be on display. A group of community members has been working on identifying ways in which the Town Hall can be a resource center, display space, and gathering place and we welcome your input! Please contact us if you have old photos of homesteading and/or activities within the township that you would be willing to have copied and displayed or artifacts (e.g. small pieces of farm equipment, old tools, household items, etc…) you would be willing to loan for inside display. We do not have the capacity to store items so they will be returned to you immediately following the display. Contact info: Jo Thompson woodfarm1785@gmail.com or Duane Madison at 525-5645. Please do not drop off items at the Town Hall. Thank you. “Our Sami Heritage” Saturday, April 28, 7pm, Town Hall. Marlene Wasuri, Chair of the Sami Cultural Center of North America and long time Duluth Township resident will speak and Sami art will be displayed. Refreshments. Free and open to the public. All are welcome. Celebrating our Common Ground in Images, Words, and Music! (December, 2017) Event included historical photos depicting gardens, orchards, beehives, livestock, and fields along with the residents who worked the farms. And a writing workshop, readings. and live music. The evening featured displays of local artwork including including quilts, baskets, pottery, fiber art, and 3D art. Poets and authors read their works and there was live music from local musicians. 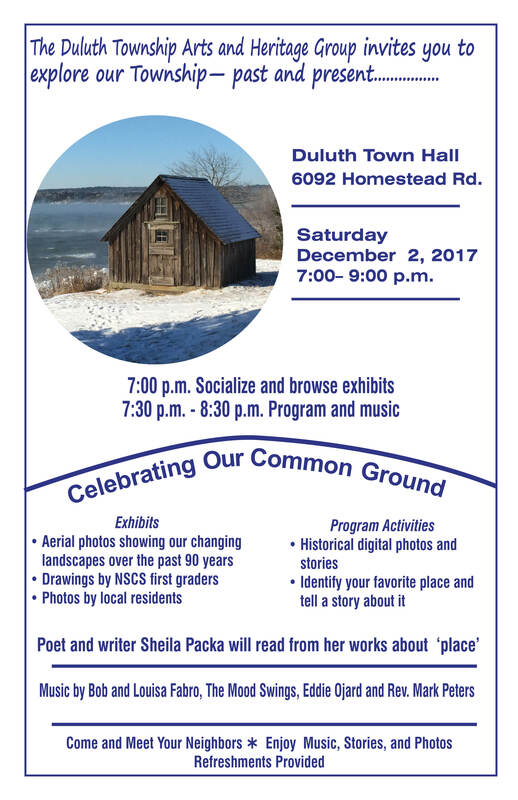 The Come On Home Party sponsored by the Homesteaders included an Arts and Heritage artifact display and slide presentation entitled: Duluth Township, A Sense of Place.